Allegro Medical presents the Tranquility Body Cleansing Washcloths with Aloe. Supersoft, cloth-like, disposable wipes are pre-moistened with aloe, hypoallergenic and alcohol-free for multipurpose use. Large size allows for quicker clean up. Easy open flip-lid (50 pack only) reseals to keep wipes moist. 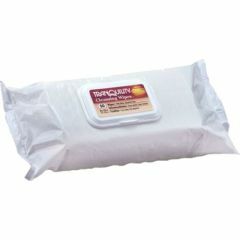 Travel Pack size is convenient to carry and can easily be warmed in the microwave for a bed bath. Latex-free. Great for those personal clean-ups and leaves a good fresh scent. are these cloths flushable? If not...are there any that are?